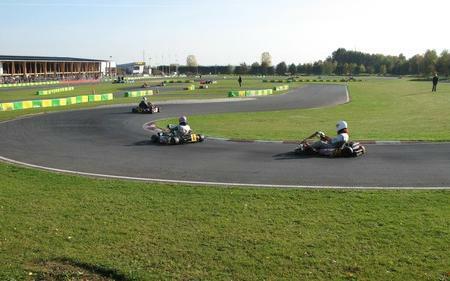 Find hotel near Karting De Caen Demouvill ..
Karting de Caen Demouville provides karting on 3 tracks which are available, ranging from 550m to 1100m. These adventurous sessions are pretty challenging for friends, groups and families. There is a clubhouse on the rooftop provided for drivers and visitors both alike. Children below 6 years of age are not allowed for the rides. How popular is Karting De Caen Demouville? People normally club together Mondeville 2 and Laser Game Evolution Rives De L'orne while planning their visit to Karting De Caen Demouville. Très bonne ambiance, bon staff et kart de qualité, je recommande.